I just managed to squeak in my final Coffeeneuring ride on the last possible day. It was an easy, flat 13.2 mile ride from downtown Woodinville to Belle Pastry in Redmond, WA. I was honestly surprised I had 13.2 miles left in me after the previous day's ride. On Saturday, a few of us stupid brave souls (Theo, Bill, Geoff, and myself) attempted a 300K ride from Bremerton to Seattle. The ride started at about 7:15am in Bremerton, which required taking a 6:00am ferry from Seattle. The morning started dark, cold, and too damn early. The temperatures were in the mid 20's when we started, and climbed through the day into the low 40's. As soon as the sun went down, the temperatures plummeted. By the time we reached our penultimate control (near Sumner) the temperature was below 32, and our water bottles began to freeze. Theo and I rolled into Seattle about 00:40, with Bill rolling in about 02:20. Geoff, perhaps the wisest of the three, bailed out in Rainier (~114 miles in) and got a ride home from his wife. The next day my legs were stiff and achy. I didn't think I could ride at all, but several cups of coffee at home (and a healthy cup of HTFU) got me on the bike and, more importantly, carried me to MORE COFFEE. Belle Pastry (formerly known as Le Rendez-Vous Café) is a cute French-style bakery in Redmond's Belle Bottega shopping center. In the 2012 Coffeeneuring season, I visited Le Rendez-Vous Café and had an excellent pastry called, coincidentally, Paris-Brest. Sadly, there was no Paris-Brest available this visit. 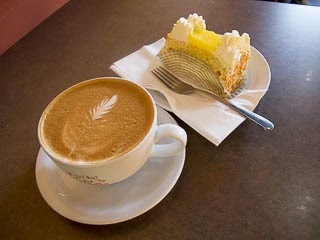 I had to console myself with a latte and an awesome piece of lemon cake.